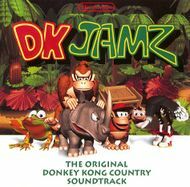 DK Jamz is an official soundtrack for Donkey Kong Country, released in 1995. It has been highly praised for its diverse and good quality music. DK Jamz was mainly composed by David Wise, with the occasional assistance of Robin Beanland and Eveline Fischer. David Wise has stated that he wanted the music produced by the Super NES' SPC700 chip for the game to sound similar to the Korg Wavestation synthesizer. DK Jamz was later remade by OverClocked ReMix, under the name "Kong in Concert," as a tribute to its original composers. ↑ From Rare: Scribes Q&A: Once he'd polished off the new DKC3 GBA score Dave found the time to dig up a full list, and it looks like this: Robin did Funky's Fugue, Eveline did Simian Segue, Candy's Love Song, Voices of the Temple, Forest Frenzy, Tree Top Rock, Northern Hemispheres and Ice Cave Chant, and the rest was the doing of Mr. Wise. This page was last edited on December 4, 2018, at 09:23.